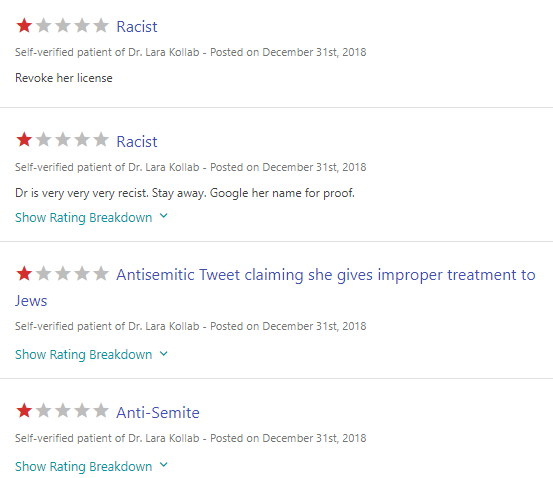 While Muslim doctor Lara Kollab has been on an anti-Semite rant for years, it seems that she has basically pulled all her social media down after being called out for what she posted. Most of this is several years old, but a person practicing medicine anywhere, especially in the US who claims that they want to give the wrong medicine to patients should be eliminated from any medical practice forever and can never be trusted. Fortunately, on Monday, she was fired. Here's some of the tweets that Twitter, which we know bows to Islam, allowed to stand for years. 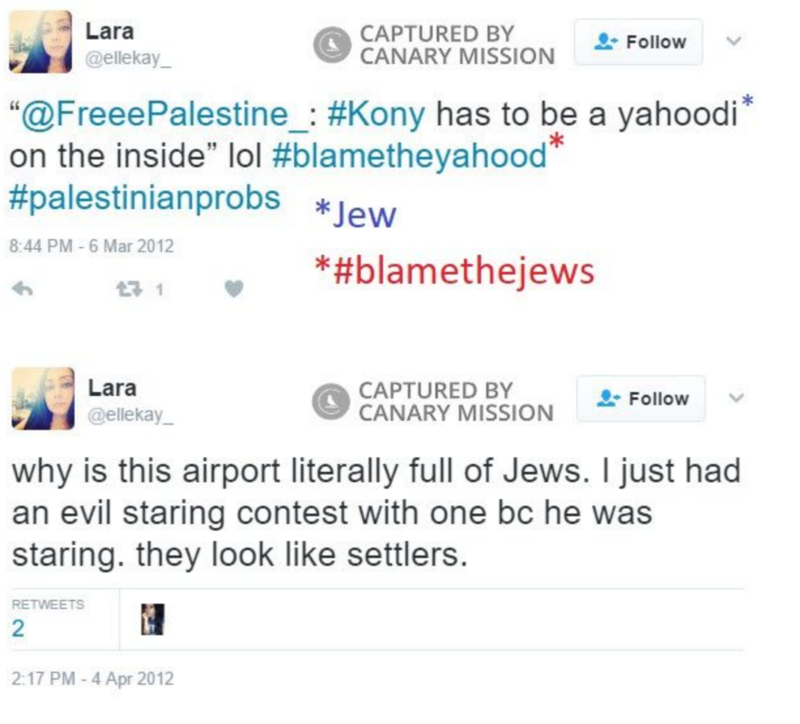 Canary Mission provided some background on Kollab. 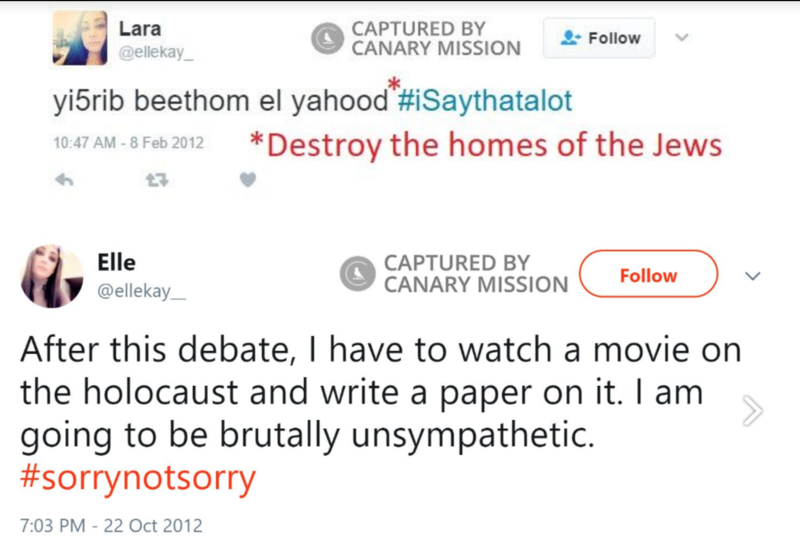 Lara Kollab has called for violence against Jews, spread anti-Semitism, trivialized the Holocaust, defended the terror organization Hamas and supported terrorists on Twitter. 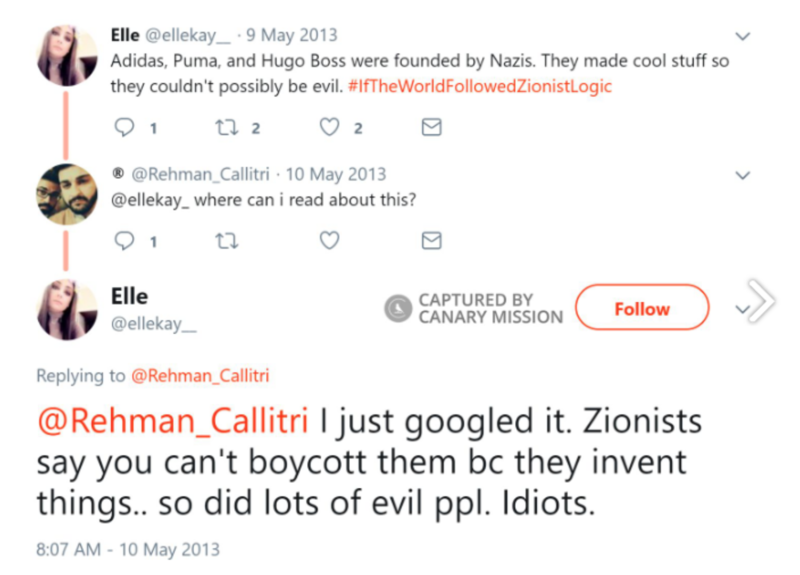 She has also compared Israel to Nazi Germany, spread anti-Semitic conspiracy theories and hatredof Israel, and accused Israel of exploiting the Holocaust. Kollab is a supporter of the Boycott, Divestment, Sanctions (BDS) movement and a supporter of Students for Justice in Palestine (SJP). She is also is affiliated with Al Awda. As of December 2018, Kollab’s LinkedIn page said she was an Internal Medicine Resident based in Cleveland, Ohio. She graduated from the Touro College Of Osteopathic Medicine (Touro) with a D.O. in 2018. She received a bachelor’s degree from John Carroll University (JCU) in 2013. On October 8, 2017, Kollab said on Facebook that she was working at Loyola University Medical Center in Chicago as part of her fourth year of medical school. 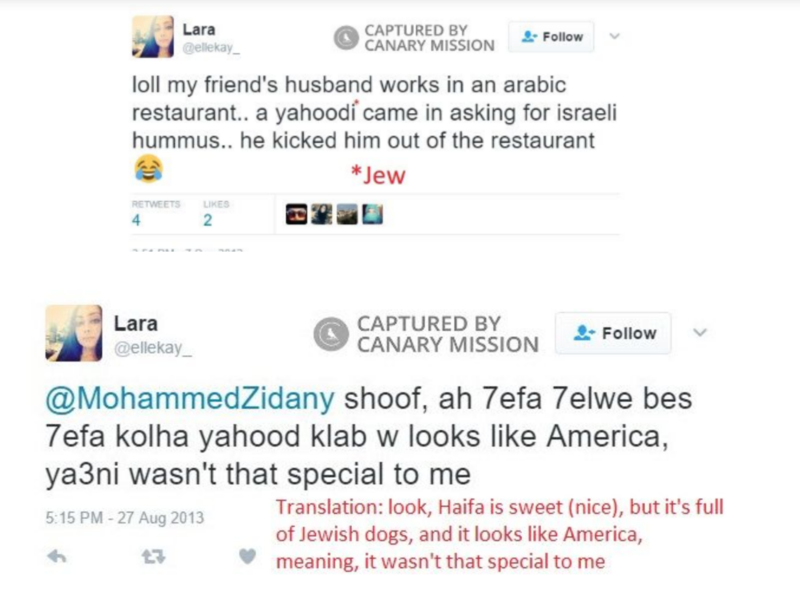 In March 2018, Kollab used the alias “Elle Kay” on social media, but went by “Lara Kollab” as of December 2018. She has also called for violence against Jewish people, as well as made light of the Holocaust. Aussie Dave posted screenshots of even more disgusting tweets from Kollab and the apparent backlash from them. 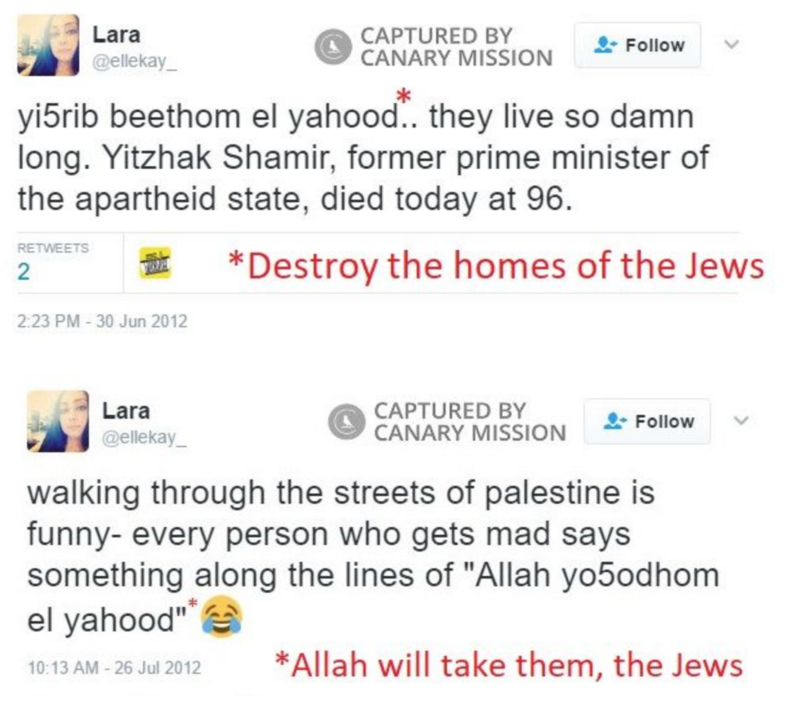 An Internal Medicine Resident based in Cleveland, Ohio, Lara herself suffers from a serious case of antisemitism (hat tip: Jackie). Pretty scary sentiments, especially coming from a doctor who may have yahood Jewish patients. But not to worry; word is getting around. Kollab also seems to have removed all of her social media accounts. But I suspect it is too late and her career is on life support. 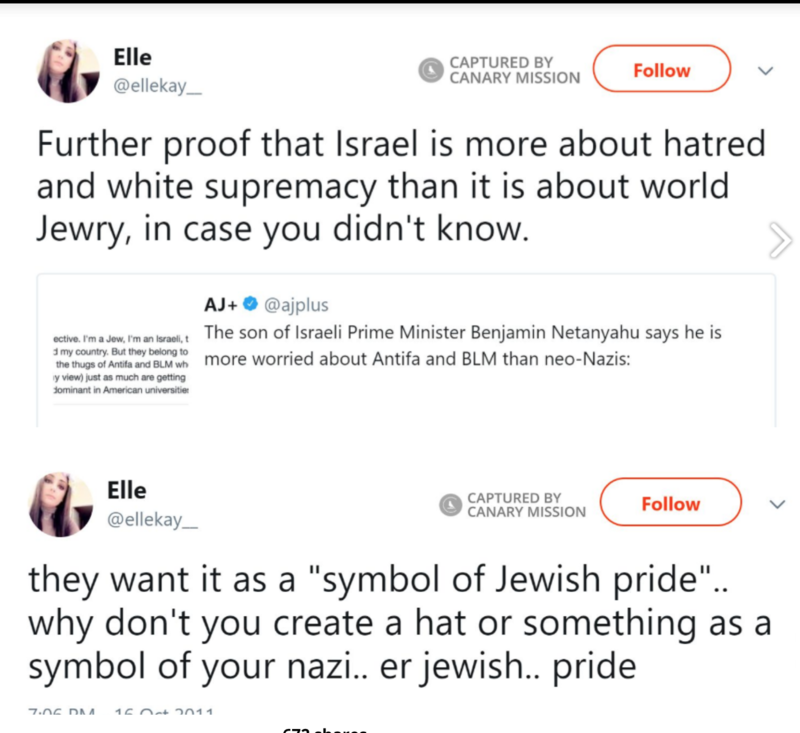 If she is willing to post this on social media about Jews, how about other non-Muslims, or even more, what if she decided to devoutly follow the Koran and do it to hypocrite Muslims? Her license should be revoked and she should never be allowed to practice medicine ever in the united States. Furthermore, an investigation into her practice thus far should ensue as she may have just done the very things she claims she will do to past or current patients. At least there is a start now. Cleveland 19 News, a CBS affiliate reports that Kollab has been canned at The Cleveland Clinic. Great, it only took you guys 7 years to deal with this, but glad you got it right. Now, about that license.